Provide tadpoles with a safe place to become frogs! Get a plastic container, such as a storage bin. Stack some rocks in one area of the bin in a tall enough pile that the top of the pile will be out of the water. Put some aquatic plants in the container. Make a ball of silly putty, stick the base of a paper umbrella in the putty and attach the putty on the rocks to provide some shade. Fill the tub with the same water that contains the tadpoles. 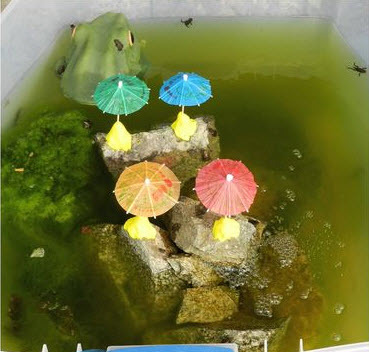 Set some floating items in the water for the baby frogs to use as rafts or underwater shade areas. Sprinkle pieces of lettuce over the water for the tadpoles to eat.